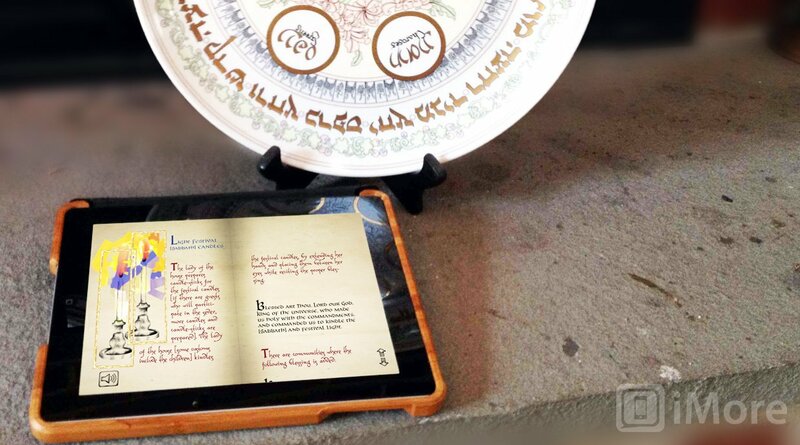 Just like at the first Passover Seder, Jews around the world will gather with their iPads around the traditional festive meal and retell the miracle of our freedom from Egyptian slavery. OK, maybe they didn’t have iPads at the first Seder, but you can be sure that lots of Jews will have their iPads out at this year’s Seder. Thankfully, there are plenty of apps this year that can keep you connected to the action and otherwise engaged during some of the “less” interesting parts. The Passover Seder is the meal that involves the telling of the story of the Biblical Exodus from Egypt. 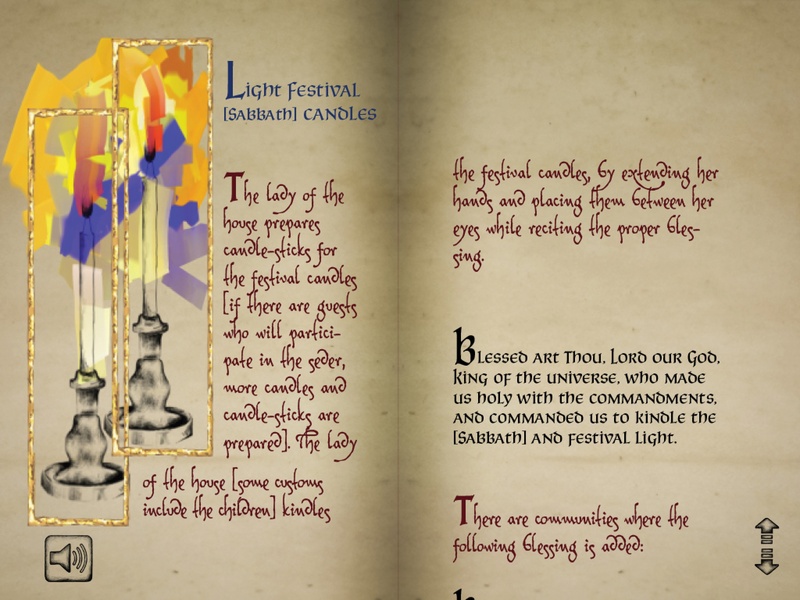 The narrative of the journey from slavery to freedom is called the Haggadah and it is filled with stories, traditional food and blessings and sometimes regional or familial customs. 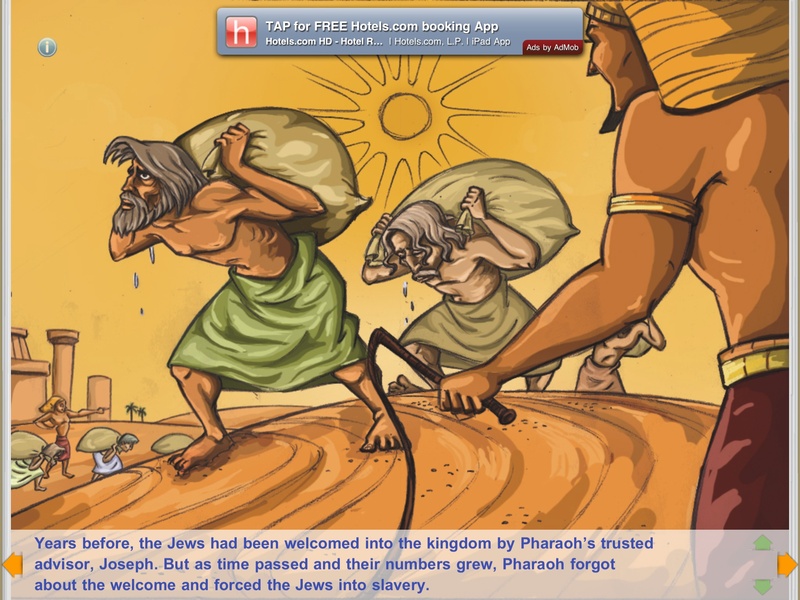 If you have lots of kids around the Passover table, you might want to download Story Chimes’ Passover: The Journey to Freedom – a free interactive book about the Exodus. This app tells the Passover story, has matching games for the kids, had beautiful illustrations and music. The Ultimate Digital Haggadah, from Downhill Publishing is really a work of art. Pages look they came out of a rare illuminated Haggadah (probably because they did) and the Hebrew is magnificent. This one is a bit “traditional” in translations and not exactly “gender neutral” in its God references – but it is beautiful to behold. “The Haggadah” from Melcher Media is a more contemporary Haggadah. Text and illustrations are also beautiful in this edition and there are recipes and activities to engage the kids during the Seder. The “Haggadah for Passover” from Kosher Penguin is much less expensive and is a little more like the bare bones approach found in the old Maxwell House Haggadahs. It can certainly get the job done – without the fancy illustrations and games. In my house, I wrote a family Haggadah and update it each year. I then email it to all those in attendance (and those who are far away) as a PDF file. I then encourage everyone to use their favorite PDF viewer on their iPad or other device and follow along – being careful not to spill any of the meal on their iPad! Sometimes, kids can get a little fidgety at the Seder, so good thing there are some fun Passover apps that can keep kids entertained both before, during and after the Seder and throughout the holiday of Passover. 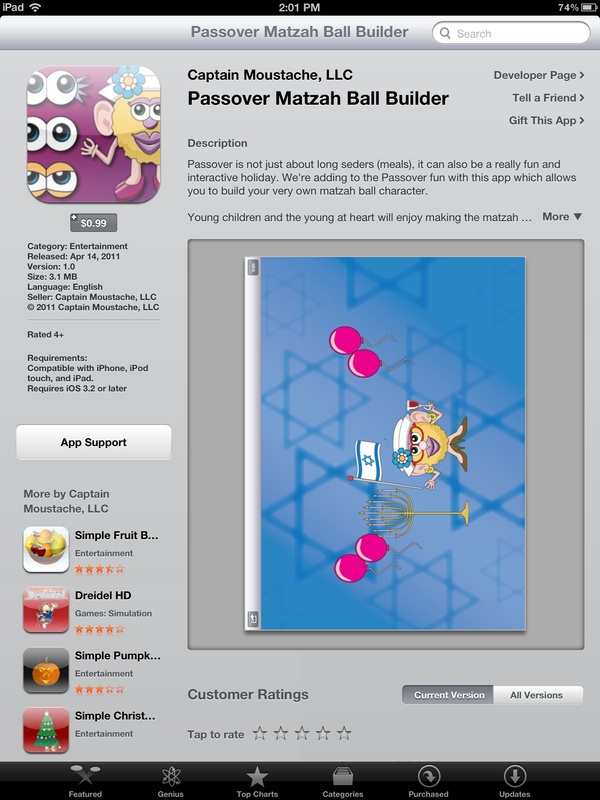 Passover Matzah Ball Builder by Captain Mustache is sort of like Mr. Potato Head meets Passover. You add arms and legs and ears and stuff and build a Matzah ball character. Now, Matzah is not exactly the tastiest holiday delicacy. If you have ever eaten chalk, cardboard and dirt together – you have a pretty good idea of what matzah tastes like. There is an actual app that lets you digitally “dress up” your matzah – adding chocolate, jam or other tasty spreads. Food is certainly a big part of the holiday and there is no shortage of Passover related cookbooks and food apps in the App store. 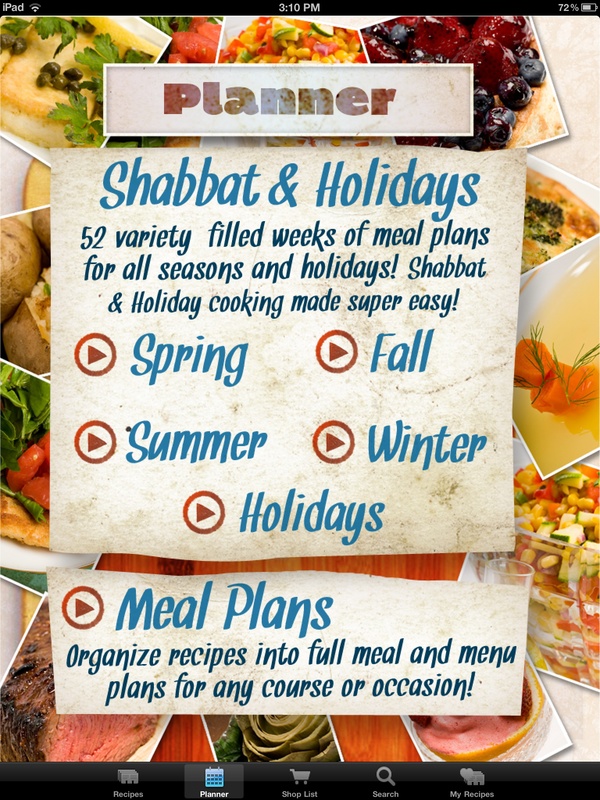 Passover Food Street, by FeelSocial offers a nice interface with lots or recipes and tips and trips. You can also take pictures of your Passover creations and save them for future reference at Seders yet to be. And What would a Seder be without music? Thankfully, the good folks at Rusty Brick have produced Jewish Radio to help you liven up the meal with some Jewish music streaming from stations around the globe. 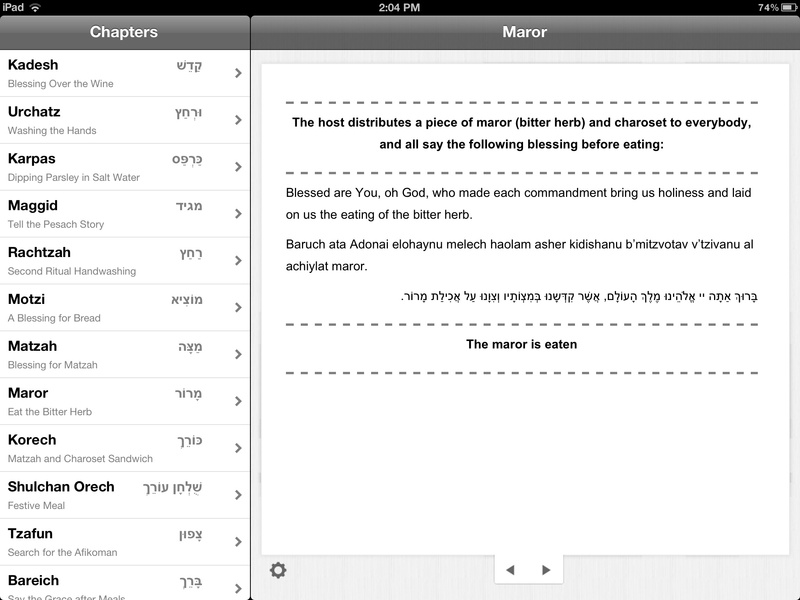 So, bring your iPads to the table, load them up with these great apps and be prepared for a fun time at the Seder. At my family Seder, we use our family Haggadah in PDF form (as mentioned above) and we set places for our kids who are grown and out of the house (some traveling the world.) This year, in those empty places will be iPads and iPhones connected via Skype and FaceTime so our kids can be with us. Since they each have an electronic edition of the Haggadah, I can call on them to participate and we can see their expressions and they can see us around the Passover table. Do you have any Passover traditions? Are you using digital media or technology in a creative way this Passover? Let us know in this forum thread.